Solar power plant works by absorbing the sunrays which are in the form of radiation coming from the sun. Sun is the major source of energy on the earth. Solar energy enters into the earth’s atmosphere in the form of radiations at different wavelength. These radiations can be converted into other form of energy such that heat and electricity by using proper equipment and setup. Sun is a renewable source of energy and mostly sun light is available at every part of the earth (except some places). Solar energy can be directly converted into electricity by using photovoltaic cells or by indirect method i.e. solar power plant. Solar power plants require large setup for generation of electricity. According to the present scenario solar power works as the anti-dot on the problem of increasing cost of fossil fuels and pollution produced by the consumption of fossil fuel. The requirement of the solar energy comes into play when the fossil fuels have limited stock and sources which will not be stay long. Solar power plants have two types both have different components, working operations and have different applications but both use sun radiation to generate electricity. This power plant has photovoltaic cells, as name suggest for power generation. This power system generates electricity for medium and small size applications like for domestic purposes, street lights or at some mobile area where electricity supply lines can’t reach. The main drawback of its initial cost because PV cells are made up silicon as we know silica/sand is available in abundant on earth but the extraction process is very costly, which increases the cost of PV cells. A domestic solar power plant has various components which are arranged in proper sequence for generation and consumption of electricity. Following are the major components of solar power plant. Solar panel is made up of solar cell or small photovoltaic cells or we can say that the combinations of PV cells are known as solar panel. This is the main component in the solar power plant. All the solar radiation falls on solar panel which converts into electricity. Generally a solar power plant consists of 30-35 solar cells. We use combination of PV cells because a single PV cell is not capable to produce high power. Solar cells are made up of semiconductor material i.e. which is neither metal nor non-metal. Silicon is best semiconductor used in the solar cell having properties of both metals and non-metals. Solar cells are made up of p-type and n-type silicon semiconductor. Silicon is doped by pentavalent impurity to convert it into p-type semiconductor which has excess number of holes or positive charge, this p-type semiconductor joint with n-type i.e. negative charged semiconductor. These p-type and n-type semiconductor together forms a diode. These cells start working when sun rays fall on solar panel which we will study in working procedure. For large power generation number of solar panels joins together at large area. The output electricity is transferred through the transmission line at the desired location. Solar panel generated D.C. power but most of the time we require AC power because our most of the electric works better on AC supply so to convert DC into AC we need some equipment. 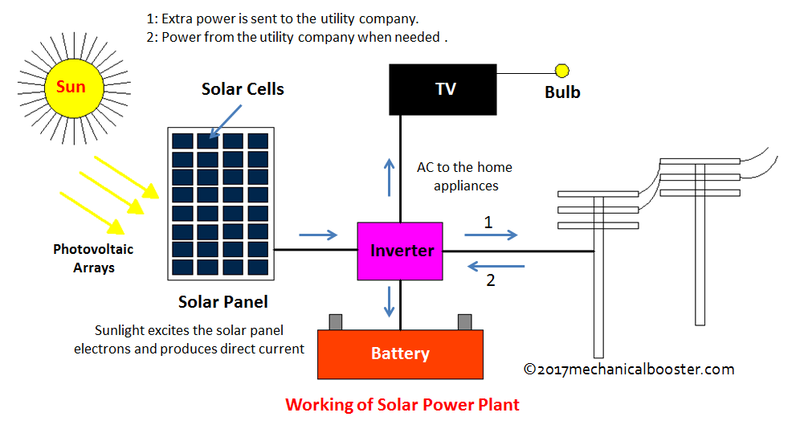 So, inverter comes into the play which converts DC power supply from the solar panel into the alternating current supply. Sun is not available at 24 hours it is the major drawback of the solar power generation. So, the major requirement of power at night as compare to day that’s why the power storage system or device is required. Most of the time Lithium-ion batteries are used for power storage. In day time sun is available most of the time and power consumption are less. Another method to store energy is to lift the water at high altitude by using solar power and then used it to run turbine when it requires. The potential energy of stored water at higher altitude will run the turbine and generates electricity. Sometimes we can’t deal in power interruption but solar power is not continuous power generation system. In case of some emergency we require a power backup such as electric generators etc. In rainy seasons and winter sun is not available all the time so power backup is also a part of solar power plant. These are coming into some accessories for proper function of the system. To regulate the power we require some controls, array, circuit breaker panels, AC panels and wires. As we discussed earlier the working of the solar power is totally depend on the solar radiations. The sun rays come from the sun in the form of small- small energy packets known as Quanta’s or photons. These radiations fall on the solar panels. Solar panels are the combinations of solar cells. A solar cell is the combination of both p-type and n-type semiconductors both are in contact with each other. When sun rays fall on to the solar cell then electron from the high concentration region i.e. from n-type semiconductor jumps towards the low concentration of electron region or electron valency region i.e. p-type semiconductor region. The diffusion of the electron continuously takes place into the p-n junction and creates electric field in the form of potential difference. This potential difference carries out by using some circuits, connecting p-type semiconductor with positive terminal and n-type with negative terminal. This power comes out into the form of direct current to convert it into AC inverter comes into play which converts the DC into AC after that power generated by solar cell transferred to supply. The supply can be utilized directly or may be stored for later use by using Li-ion batteries. The working of solar plant continuously done until the sun light available after that alternative source or emergency systems comes into play like generators or power stored systems. This is the working of solar power plants having photovoltaic’s cells. The solar thermal power plant is another type of solar power plant. Solar thermal power plant is the second kind of power generation system by the solar radiations and without any use of PV cells. This kind of power plant requires a very large area for operation. 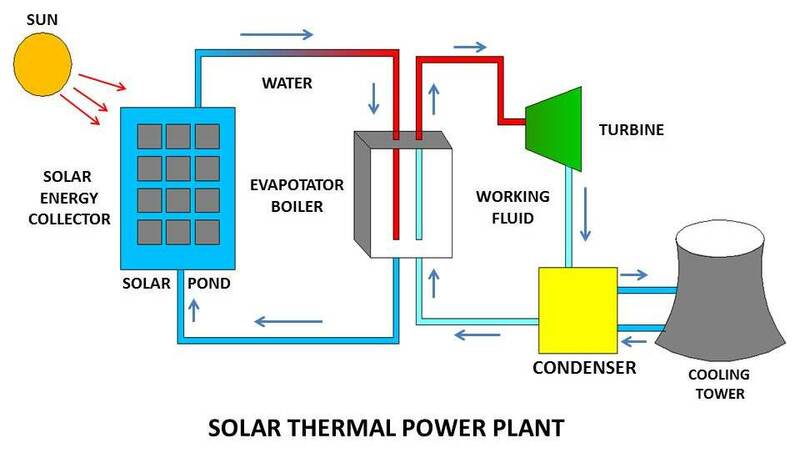 Solar thermal power plant is combination of solar energy and thermal energy. The sun radiations used as fuel in the power plant. Solar energy is converted into the heat or thermal energy which further use as mechanical energy to operate the turbine and generators. Solar power further categories based upon the power cycles i.e. low, medium and high temperature cycles. These cycles are based upon the solar radiations and type of collectors used for collecting the solar radiations. In low temperature cycles the temperature is limited to about 100oc, in medium temperature range varies from 150oc to 300oc where as in high temperature cycles temperature may goes above 300oc. Solar pond: The solar energy coming from the sun firstly absorbed by the solar pond. Solar pond is a reservoir of water where sun rays directly focus by using solar energy collectors. After that solar energy increases the internal energy and raises the temperature of solar pond. The fluid in the solar pond may be directly used as the working fluid if its temperature reaches up to evaporating temperature or other way is to use secondary fluid known as working fluid. The fluid from the solar pond goes into the cyclic process. Solar energy collectors: Solar energy collectors are the device used for collecting the solar radiations and focus the solar radiations at particular location to transfer the heat energy into the solar ponds or fluid. Generally, two types of collectors are used first is non-concentrating or flat plate type solar collector which is used for low temperature cycle and second one is concentrating or focusing type solar collector which are used for medium and high temperature applications. Collectors make the solar energy more useful. Simple flat plate collectors are very simple, the collecting area is equal to absorbing area where as focusing type collector have several arrangements of mirrors and lenses for proper concentration of sun light due to this by using focus type collectors we can capture 100 times solar radiation as compared to flat plate collector keeping the area same. By using focusing type collector we can directly generate medium pressure steam. 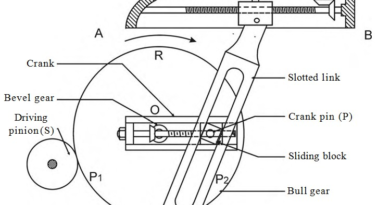 Working Fluid: It is the fluid used in the cyclic operation. We use some other fluid as a working fluid because sometimes solar energy is not capable to evaporate the water. We use working fluid which gains energy from the solar pond and evaporate easily or having evaporation temperature less as compare to water. Generally, brine or some organic fluids are used as the working fluid. After evaporation working fluid goes through cyclic operations in turbine and then through condenser it goes again into the evaporator boiler. The cycle continuously repeated. Evaporator Boiler: In this device, working fluid is kept and gains latent heat of vaporisation from the sun radiations or by solar pond. Working fluid is circulating throughout the cycle by evaporating boiler. Turbine and Generator: Turbine and generators are the essential part of the power generation system. Working fluid goes through the cyclic operation runs the turbine which is connected to the generator. Generator generates electricity which is transferred to the required location. Condenser and cooling tower: After turbine working fluid goes into the condenser, condenser and cooling tower condense the working fluid and send back to the evaporator boiler with the help of pump. The working is very simple almost similar to any thermal power plant. Solar power plant also works on Rankine cycle and Brayton cycle as per the requirements. With the help of construction part, we can easily predict the cycle of operation and working. Working fluid gains latent heat of vaporisation from the direct solar radiations or by means of solar ponds in the evaporator boiling and converts it into vapour form. After that it runs the turbine which is connected to the generator. After turbine working fluid goes into the condenser and loses heat and again sends back to the evaporator boiler with the help of pump. This whole cycle repeated continuously until the sun remains in the sky and radiation falls on the earth surface. This power plant has many drawbacks because sun is not available all the time and power generation can’t be done continuously. Solar power generation system has following advantages and disadvantages. Solar power plants work on solar energy which is available in abundant on the earth surface at most of the places. Solar energy is available at free of cost. Solar power plants produce negligible pollution as compared to thermal power plant. Solar power is available at free of cost after some initial cost. The energy produced is renewable energy with negligible cost. Quantity of water use in solar power plants is very less as compare to other power plants. So, we can say that solar power plants save lots of water. The major drawback is the availability of the sun. Sun radiation of desired intensity is not available whole day. Solar energy is a time dependent source of energy. We can’t rely on solar energy completely. If we talk about our country sun is not available at all the location with same intensity of radiation. Intensity of solar radiations varies according to the location. While sun rays coming to sun different factors are dominate. Intensity of sun radiation varies according to weather i.e. in rainy season solar energy is not available because of clouds. Sun light falls on earth surface in variable and inconsistent manner. For collecting the sun radiations at useful rate large area is required. Initial setup cost of PV cells is quite high. This is all about solar power plant. If you have any query regarding this article, ask by commenting. If you like this article, don’t forget to share it on social networks. Subscribe our website for more informative articles. Thanks for reading it.